Leslie M. Rupracht is the daughter of retired artists/art educators who moved their family each summer from Long Island, NY, to the Rupracht farm upstate, north of Syracuse. Leslie’s creative bent was nurtured early by her mother/muse and father/mentor. After earning a BA in English at The State University of New York at Geneseo, where she also studied journalism, public relations and studio art, Leslie infused her career with diverse right- and left-brained experiences. Her poetry has appeared in The Main Street Rag, Iodine Poetry Journal, Open Cut, THRIFT Poetic Arts Journal, and Kakalak Anthology of Carolina Poets (all editions); her prose is published in moonShine review, corporate and non-profit newsletters and magazines. 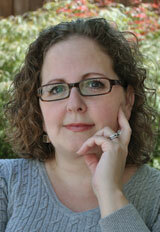 Leslie is senior associate editor of Iodine Poetry Journal, and fiction and photography editor for moonShine review. Calling Charlotte, NC, home since 1997, Leslie enjoys life and laughter with husband/favorite architect, Will Weaver, and rescue mutt, Magnum. What a wonderfully honest portrait of an uncertain life. A woman in constant transition, painfully aware of her own aging, her own flaws, handwriting gone from calligraphic to indecipherable, vanity to humility, reason to compulsion, identity to doubt. This poetic narrative of a daughter’s relationship with a mother whose illness has deprived her of memory illuminates the impermanence of things, the relativity of reality, the tenuous nature of memory, perception and personality, whether they are fiction, or fact, or something in between. Reading Leslie M. Rupracht’s poetry is like breathing–it comes naturally, its rhythms innate, vital, life-giving even in the dark–a rush of necessity and yet a sharp pain in the chest as when oxygen does not come easily. This down-to-earth book begins with a wish for some permanence of a mother’s personality, mobility, artistry, and recollection. It then draws us through the deconstruction of self-reliance, uniqueness, and memories. The author mourns that loss before reconciling herself to remember for the mother and to find some relief in her mother’s inability to recall past suffering. This insightful and resplendent gem of a book achieves exceptionality in its sharp-witted honesty and painful tenderness. Poised to touch many lives, the poems propel themselves into the hearts and minds of readers’ own experiences, hopes, and fears. In Splintered Memories, poet Leslie M. Rupracht works with language the way a master photographer uses an expensive camera. The author shows us stark but loving portraits of a mother afflicted by memory loss. Sharply focused, astonishing in their clarity, these poems are profoundly moving, with cross currents of tragedy and hope. one dollar find in Acapulco, 1962.
though she always let me try it on. piece as I happily played dress-up. a vision in the void. My mother had an intensely tactile palette. to be told Honey, swallow… Harriet, chew. tight-lipped and refusing a mouthful. to eat the same cereal day after day. hand resting in a bowl of milk. 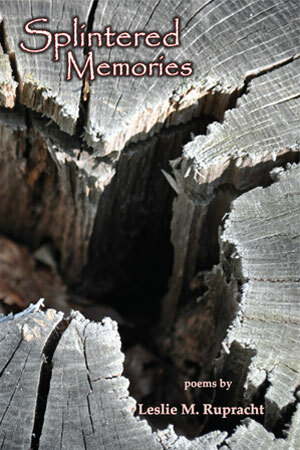 Be the first to review “Splintered Memories” Click here to cancel reply.